Well hello again. Where is February going? I don’t know about you, but to me it seems to be flying by. Our oven packed up yesterday, half way through cooking a beautiful roast dinner for friends! Thankfully, the top oven was still going well enough to finish everything off, but obviously this week we’ll be eating things that can either by done on the hob, grill or slow cooker while we wait for a new one to be delivered. Friday: Friday night curry. Thai I think. Prawn for Ste and chicken for Pb and I. I managed to pick up a couple of packs of organic chicken pieces for £2 each today. Half a pack will do the two of us, and we’ve already got the rice and spices in, so all in, it will prob only cost us £3.50. Much more economical than a take away. I’ve been useless this week when it has come to photos. Largely because I’ve simply forgotten, but here’s one of the curry. 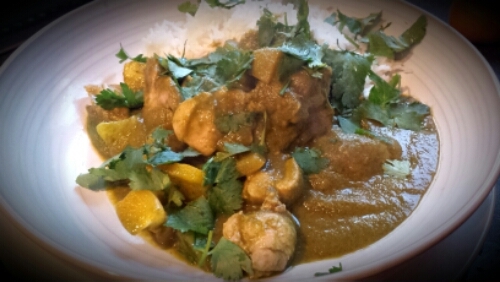 I used my Nutribullet green Thai curry paste recipe. It says delicious! I haven’t planned for the weekend yet. What’s on your menu this week?